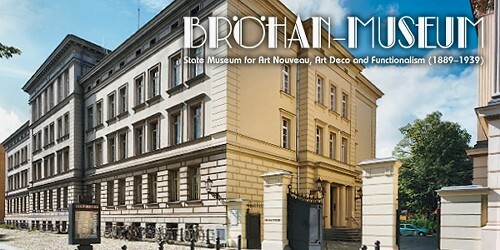 The Bröhan-Museum specializes in Art Nouveau, Art Deco and Functionalism (1889-1939) of international provenance. The collection has two areas of primary interest: decorative arts and painting. The art objects are arranged in room ensembles for presentation. These ensembles aim at giving a representative synopsis of the period from Art Nouveau – as a precursor of modern design – up to Art Deco and Functionalism by way of chosen pieces of glass, ceramics, porcelain, silver and metal work in combination with furniture, carpets and lighting as well as prints and painting. The collection illustrates the equal value of each area of artistic production. Art Nouveau, Art Deco, Functionalism – It gives priority to works of French and Belgian as well as of German and Scandinavian Art Nouveau besides ensembles of French Art Deco. The Bröhan-Museum houses an exceptionally rich collection of porcelain from distinguished manufactures (KPM Berlin, Royal Copenhagen, Meissen, Nymphenburg, Sèvres etc.) as well as pieces of metal and glass works from the most important artists and designers of the time including early industrial design. The spectre includes prominent examples from the work of the following artists and producers: Precious glass by Emille Gallé and Joh. Loetz Wwe, furniture by Eugène Gaillard, Hector Guimard, Louis Majorelle, Bruno Paul, Richard Riemerschmid, Peter Behrens, Joseph Maria Olbrich, examples of Art Deco in the metal works of Edgar Brandt, furniture ensembles by Jaques-Emile Ruhlmann, silver by jean Puiforcat, Paris, and Georg Jensen, Copenhagen, as well as Art Nouveau fayence from the Bohemian Amphora works. Important designers of serial production of the period 1889-1939 are represented with exemplary works: Friedrich Adler, Albin Müller, Peter Behrens, Christopher Dresser, Jan Eisenloeffel, Hermann Gretsch, Archibald Knox, Trude Petri, Wilhelm Wagenfeld.